Beloved Canadian children's author Robert Munsch (OC) was born 70 years ago (1945) today in Pittsburgh, Pennsylvania, the 4th of 9 children. On his website robertmunsch.com he recounts always writing funny poetry, but not doing well otherwise in elementary school. 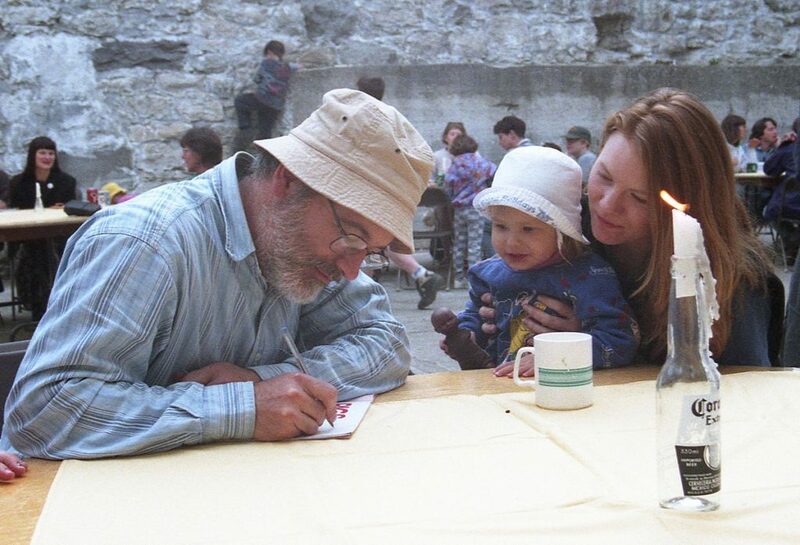 Below, Robert Munsch gives an autograph near his Guelph, Ontario home in 1997. Robert Munsch eventually accumulated a Bachelor of Arts degree in history (1969, Fordham University) and a Master of Arts degree in anthropology (1971, Boston University) while studying to become a Jesuit priest. Working with children in daycare centres and orphanages during his studies, convinced Munsch that he'd prefer a career working with children instead of the priesthood. Robert Munsch enrolled at Tufts University and received a Master of Education in Child Studies in 1973; during this time he made up his first children's story, Mortimer - which wouldn't get published until 12 years later. Munsch moved to Canada in 1975 with his wife Ann and they both began work at the University of Guelph. While working in their preschool/daycare, and also as a lecturer and assistant professor in the Department of Family Studies, Robert Munsch made up many stories for the children he worked with and was encouraged to publish them. Robert Munsch's first published books were on Annick Press - 1979's Mud Puddle and The Dark. He's written and published at the rate of 2 books a year from that time on, until his most recent books Moose! and Give Me Back My Dad! came out in 2011. Although 80+ books have been published to date, Munsch also has hundreds of unpublished stories. In 1985, with book sales now over 50K/year in Canada, Robert Munsch gave up his day job at the University of Guelph in 1985 to focus on writing children's stories full time. Love You Forever, a book written by Munsch after he and his wife had suffered the loss of two stillborn babies (1979 and 1980), was published by a new publisher, Firefly Press in 1986. Although not as funny as his previous books, Love You Forever was an instant bestseller in both Canada and the U.S., with sales exceeding 18 million copies, and is still a fan favourite today with baby boomer parents and grandparents, their kids and grandchildren. The Robert Munsch's became adoptive parents of 3 children - Julie, Andrew, and Tyya - who are now grown and on their own. All of his books are based on real children (including his adopted children) and with one exception (Angela's Airplane) the children's names in the books are the names of the real-life children the story is based on. Murmel, Murmel, Murmel is based on Robert Munsch's experience as a stay at home dad with a newly adopted son (Andrew). Illustrator Michael Martchenko is among 12 other illustrators that Munsch has worked with. Robert Munsch has said he likes to visit schools and daycares without notice, and when he went on book tours he liked to stay with families as these visits often formed the basis for many new stories over the years. He's been recognized in Canada for his contribution to children's fiction with literary and other awards, including being made a Member of the Order of Canada in 1999, receiving a star on Canada's Walk of Fame in 2009, and having two Ontario public schools named after him (one in Whitby and another in Mount Albert). On robertmunsch.com, Munsch shares his own struggles with addiction (cocaine and alcohol) and mental health issues (he has been diagnosed as obsessive-compulsive and manic-depressive or bipolar), and encourages parents to "talk to their kids honestly, listen to them, and help them do their best with their own challenges." He has been in recovery since entering treatment in 2009 for alcohol and drug addiction. "Age has kind of defeated me. I never did recover all my fluency that I had before the stroke and that is most notable when I tell stories and I tell stories in front of audiences. I would sometimes forget the story, like 'The Paper Bag Princess.' I've told that 1,000 times but I just forget it. That's why I stopped touring. I couldn't do it." On behalf of Robert Munsch fans - kids, parents and grandparents that have read and enjoyed his stories over the years: We'll love you forever, Robert Munsch - Happy 70th Birthday!